Sarasota is a historic city on the Gulf Coast of Florida that is as rich in culture as it is in breathtaking landscapes. It's no wonder that this city is a favorite for those relocating to Florida's sunny beaches. Living in Sarasota offers all the luxuries of staying in an island resort with all the perks of living in a major metropolitan city. Real estate in Sarasota offers a vast arrays of ammenities, and ranges from picturesque waterfront properties, to safe and secure gated communities. Sarasota also has a wide selection of beautiful golf course communities ideal for retirees and snowbirds. 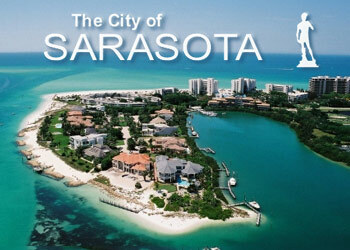 The city of Sarasota also includes Siesta Key and Barrier Island. Neighborhoods to consider on Siesta Key includes Bay Island, Coronas Park, Hidden Harbor, Lands End, Riegels Landing, Sanderling Club, Sandy Hook, and Siesta Key Village. Popular neighborhoods on Sarasota's Barrier Island includes Longboat, Lido, Casey and Bird Key, as well as St. Armands. Sarasota locals moving to or from Florida, Moving On Up™ has got you covered. We are proud members of the American Moving and Storage Association (AMSA) and the Better Business Bureau. Our moving company performs same-day local moves for relocation anywhere within a 250 miles radius of Greater Sarasota. Call us now at 1-800-945-9569 to speak to a moving consultant for more information. Plan your South Florida regional relocation by visiting our Local Moves and moving promotions pages. Moving On Up, Inc.™ services the city of Sarasota for all your moving needs! Move from Sarasota County within Florida or anywhere across the states with Moving On Up.™We offer moving and storage to and from the Bradenton-Sarasota-Venice metro area. Free delivery of boxes and packing materials - no stair fees! - is included when you book with our moving company.